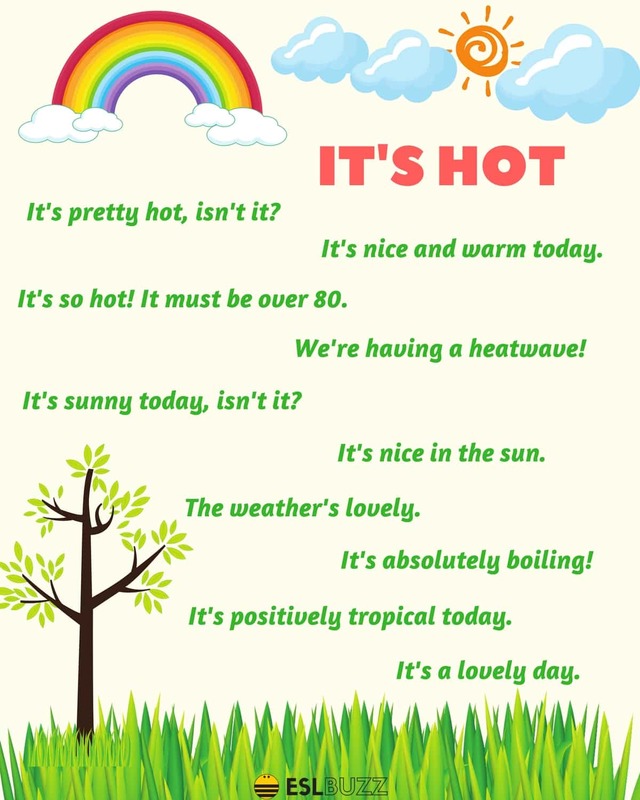 Learn useful phrases describing the Weather in English – Cold Weather, Hot Weather and Rainy Weather. 2. It’s a bit chilly. 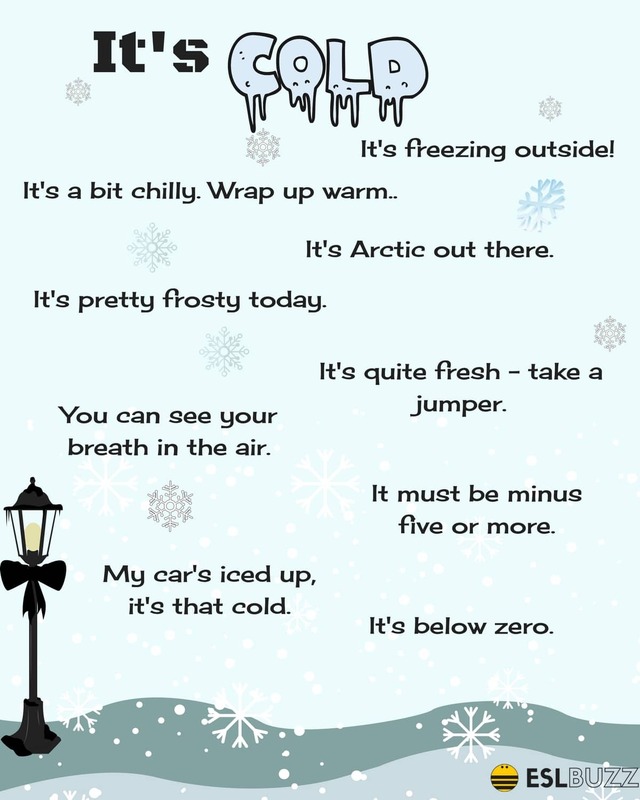 Wrap up warm. 4. It’s Arctic out there. 5. It’s quite fresh – take a jumper. 6. You can see your breath in the air. 8. It must be minus five or more. 9. It’s pretty frosty today. 10. My car’s iced up, it’s that cold. 11. I can’t believe the fog! Did you have a hard time driving today? 12. It’s freezing out today. Do you think it will snow? 13. It looks like it’s going to snow. 1. It’s nice and warm today. 2. It’s pretty hot, isn’t it? 3. We’re having a heatwave! 4. It’s so hot! It must be over 80. 5. It’s nice in the sun. 7. It’s a lovely day. 9. It’s positively tropical today. 10. It’s sunny today, isn’t it? 11. Did you order this sunshine? 12. So hot for this time of year. 13. It’s so nice out today, isn’t it? 14. The weather’s nice today, right? 15. I heard it’s supposed to be sunny tomorrow. That’s good, right? 16. We couldn’t ask for a nicer day, could we? 17. Beautiful day, isn’t it? 2. It’s only a shower. 5. We’d better run for it. 6. It’s been raining all day. 7. I’m soaked to the skin. 10. We could do with some rain. 11. Wow, it’s really (Raining/pouring) out today! 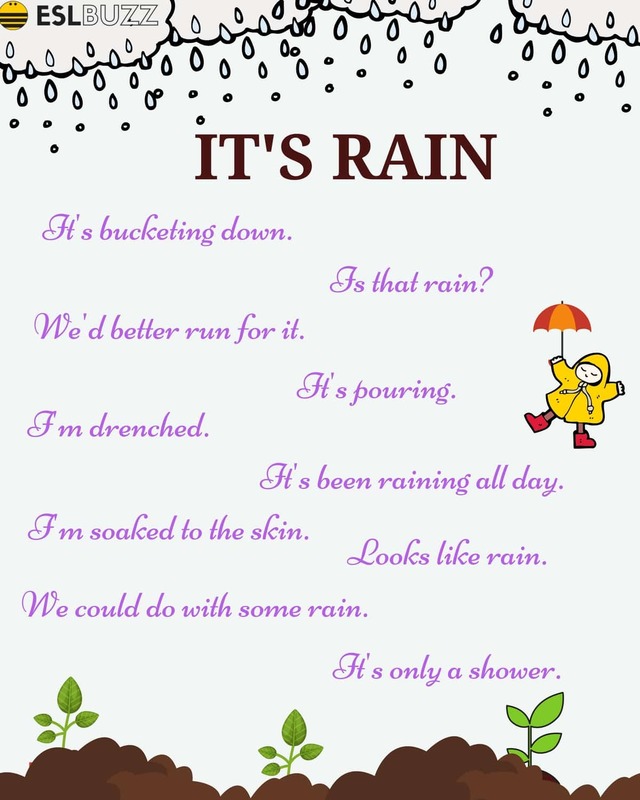 Did you get caught in the rain? 12. Can you believe all of this rain we’ve been having? 13. I hear they’re calling for thunderstorms all weekend. The high sunlit clouds drifted across a clear blue sky. The sky above was full of tumultuous, dark, ragged clouds. A sky of mackerel clouds, crimson and amber-tinted. It was a grey afternoon with a dull sky threatening rain. A cloud, ominous and black, drifted over the mountain and released a sudden shower. The sun rose in a pool of crimson and gold, spilling light all over the land and the white clouds. From freezing night, it turned to scorching day as the sun climbed towards its zenith. As the sun set, the few thin strips of clouds on the horizon turned shimmering gold. It was a lovely walk, with the sun setting behind the mountain in a sea of liquid gold. The sunsets have been glorious lately, all rosy and salmon- pink. Thunder came marching from far away with increasing tread. Lightning and thunder raged with fury. A flash of forked lightning and a great clap of thunder came close upon each other. A bolt of lightning tore across the sky and a peal of thunder followed. The wind was sighing and thrashing in the tree tops and the boughs moaned. The morning was cold and wet with a brisk wind sweeping the rain across the land. A curtain of rain beat down from the heavens. The moon was abnormally large and it bathed the earth with its luminous glow. I need to download it. How can I do?